What Does 1.1 Million-Square-Feet of Retail Look Like? Submitted by keenan on Tue, 2008-01-08 12:42. Yesterday, we posted about the Venture’s plans for 1.1 million-square-feet of retail in Moynihan East. 1.1 million-square-feet of retail is approx. Is it possible for any architect to realize an “iconic and distinctive” train hall with “well lit, spacious concourses” if it must be surrounded by the equivalent of 3 Time Warner Center malls? Or 10 Target stores? Do you have photos of comparable developments? Send them our way and we'll add 'em to the slideshow. Click here to watch the slideshow. Click "options" and check "show title and description." Submitted by Rob (not verified) on Thu, 2008-01-17 14:14.
this is way to much! 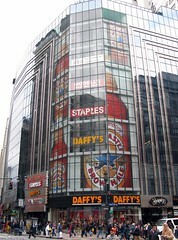 i cant imagine an aesthetically pleasing design that involved that much retail. Submitted by Visitor (not verified) on Wed, 2008-03-05 22:45. 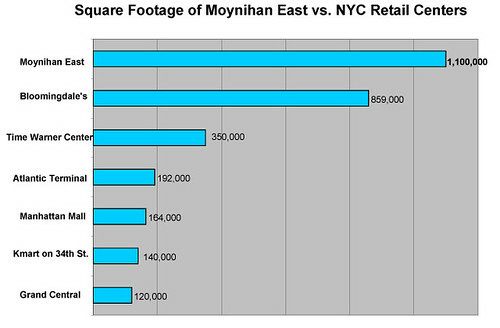 This amount of retail sq ft. seems to fit well with the total foot traffic and development for the area. Retail has to be part of the engine of development. Let it ride.